Yes, that is the Doctor rocking out in 1138 AD. Credit: Simon Ridgway/BBC via The Guardian. Doctor Who kicked off its “9th” series this weekend with “The Magician’s Apprentice”. I have just four words to say about that. This episode was epic–easily Peter Capaldi’s best performance as our favorite time-traveling alien and a refreshing change after what I thought was a lackluster Series 8 (for which I blame the writers more than the actors who were, in fact, pretty good). “Dark Water“/”Death in Heaven” were great episodes, but even they couldn’t measure up to “The Magician’s Apprentice“. This was on another level entirely. From the stunning intro (“My name is Davros.”) to the very last line (“Exterminate!”), this episode is a whirlwind of surprises driven by two of the Doctor’s greatest enemies, Missy (the Master) and Davros, “the Creator of the Daleks, the Dark Lord of Skarro”. Davros is dying and seeks a final confrontation with the Doctor to settle a very old score. 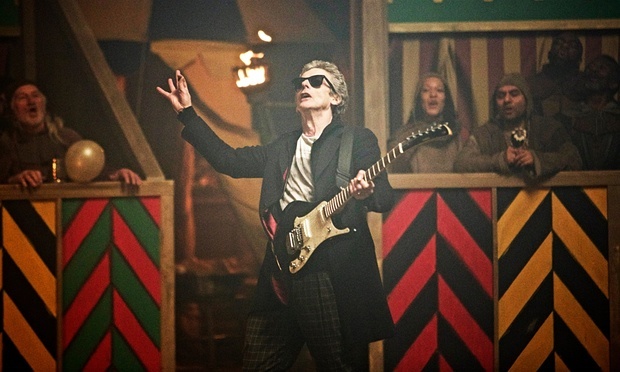 The Doctor, suspecting he won’t come back alive, throws a party in which he introduces rock music to the 12th century before facing his fate. What happens next? Well, let’s just say the Doctor isn’t Tom Baker anymore. One important question isn’t addressed, though. Who is the magician’s apprentice? I think we’ll find out the answer to that, plus what happens to Davros, the Doctor, Missy, and Clara, next week. My rating: a big 5 out of 5 for “The Magician’s Apprentice”. This entry was posted in TV Reviews and tagged davros, doctor who, the magician's apprentice. Bookmark the permalink.